According to reporting from the Miami Herald, two federal contractors from the District of Columbia have been arrested in a drug bust at PortMiami. Located in Biscayne Bay, PortMiami is the busiest passenger port in the entire world. The drug bust occurred at the passenger section of the port, when two men attempted to board a cruise ship. Peter Melendez and Robert Koehler were arrested on drug trafficking charges after they were intercepted by law enforcement and police dogs indicated that drugs were likely present in their luggage. The ship they were about to board — operated by Royal Alliance — was embarking on a seven-day party cruise to the Bahamas and Mexico. Federal agents allegedly discovered a large amount of illicit drugs on the two men, including ecstasy and ketamine. The Miami Herald reports that federal law enforcement officers became aware of the alleged drug trafficking and distribution scheme after the two men coordinated their efforts on a government issued computer. The computer was allegedly used by Mr. Melendez. It is believed that a Homeland Security officer intercepted emails in which the two men discussed their plans to smuggle the drugs on board and sell them to passengers aboard a large party-themed cruise ship. The Royal Alliance ship was expected to have more than 5,300 passengers on board. Mr. Melendez was charged with drug trafficking and conspiracy charges. Mr. Koehler was charged with drug trafficking. When Does Drug Trafficking Become a Federal Issue? It is worth highlighting the fact that these two men were arrested by federal agents. Drug trafficking and drug distribution can be charged as both a state and federal offense. This is a distinction that matters. 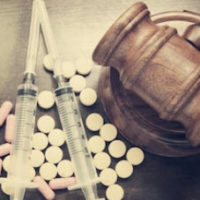 Not only will these cases be handled in different courts, but, in certain circumstances, federal drug sentencing guidelines are considerably more harsh than the guidelines set out by Florida state law. You can be prosecuted for a federal drug offense for a number of different reasons. Certainly, if you cross state lines in the course of criminal activity the federal government will have jurisdiction. However, you may also face federal drug charges even if you never left the state of Florida. If you commit a crime on federal government property or you are arrested by any federal agency, you are likely to be prosecuted at the federal level. The federal government has ample resources to take on the full range of drug trafficking and drug distribution cases. If you or your loved one is facing any type of federal drug offense, is imperative that you consult with a qualified defense attorney right away. At Ratzan & Faccidomo, LLC, our Florida criminal defense attorneys have the skills and legal knowledge required to handle all types of drug charges. If you or your loved one was arrested for drug trafficking or any other related offense, you need professional help. For a no-fee, fully private consultation, please contact our Miami law office today.